Virginie Lavey, french media aretist, she prepared a video composed with pictures shooted in the street's photo boxes. she re-shoted themini demo film shown on these boxes showing the differents pictures you can make with it. the video band was also a little bit noisy, with dust and scratches. 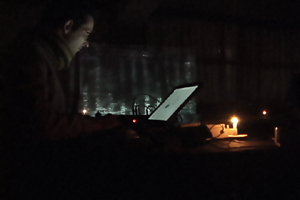 Mehdi Hercberg, french, sound live with laptop, pedal effets, digital delay, sampler, sporelec and celular phone. 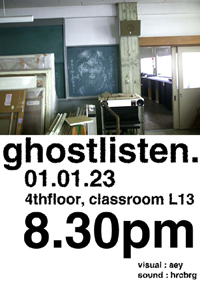 the name of the live was "ghost listen". 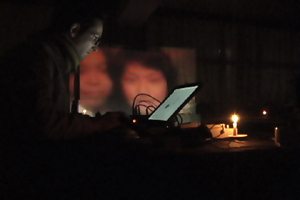 actually, the concert took place in IAMAS, school of art and new technonogy in Ogaki (Kansai, Japan). in this shool, there was many ghosts story. several students and teatchers have seen ghosts passing by some classrooms. and the live was performed in an abandoned classroom told as the most frightening room in the whole school. the ghost of a litle girl have been seen in this classroom by many students. this concert was a kind of homage to this ghost. IAMAS, school of art and new technonogy in Ogaki (Kansai, Japan).